Please join us on April 6, 2019 for the 1st Annual The Heart Smiles 5K Fun Run/Walk! 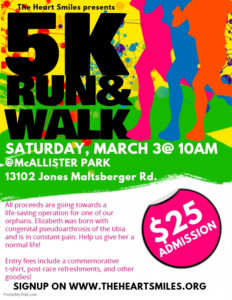 All proceeds from the race are going towards a surgery for Elizabeth Akua. She was born with a deformation of her tibia and struggles to walk to school and play with the other children. We want to give her the best shot at a normal life that is pain-free. 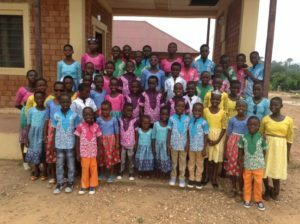 Our goal is to raise $10,000 to cover the entire cost of the surgery and rehabilitation. Registration is $25 and increases to $30 on race day. Entry fee includes a commemorative t-shirt, swag bag with cool goodies, access to hydration stations along the course, post-race refreshments, and a post-race party. Check-in will begin at 8:30 am, the first wave will be released at 10am. For any registration questions, please contact Megan. Please contact us if you would like to volunteer, donate money for water, cups, swag gear, t-shirts, or race bibs. All donators will get their name or logo on the back of the race t-shirt. Please contact Megan or Ama if you are interested and have any questions! We are looking for local companies to promote their business by putting up a booth at the finish line. Please contact Megan at megan.theheartsmiles@gmail.com, if you’re interested!